Being a huge fan of the Soul Screamers series, I of course wanted to read anything I could get my hands on by Rachel Vincent. 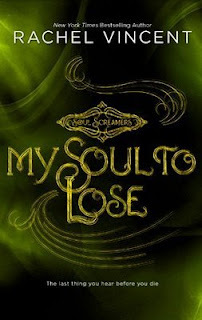 I found out about this prequel short story after I had already read up to the 4th book in the series, My Soul to Steal, so I was already well-versed in the characters and the world. I think, in a way, that the fact that I already knew what was going on with Kaylee was a big plus while reading this short story, because I could understand things differently than if I had gone in cold. Kaylee has a freak out attack at the mall, a 'panic attack', and she's sent to a psyche ward. Rachel Vincent has the ability to bring out intense emotions in the reader, which she definitely did even in this short little thing. The entire time Kaylee was in the ward, I just kept thinking "Why is she there?" Even when her aunt and uncle came to visit her, they wouldn't take her out, even though they knew exactly what was going on, and that Kaylee definitely wasn't crazy. It was so infuriating! Like I said, I think I appreciated this story more since I knew exactly what was going on. I recommend this to anyone, honestly. If you haven't read the Soul Screamers series yet, and you're looking to start, then get My Soul to Steal. And if you're like me, and you've already read all the books released thus far and you want more, then get it too! 4 out of 5 stars.